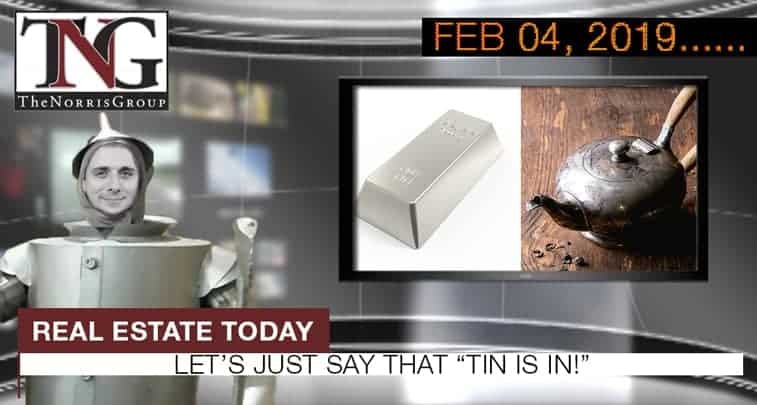 Let's Just Say That "Tin Is In!" 2019’s newest design trend. According to Redfin’s latest data, the most affordable areas for millennials wanting to buy a home are St. Louis, Pittsburgh and Columbus. Where are the top 20 metropolitan areas where peopel actually prefer to buy with cash? Aaron Norris will be presenting Technology Trends and Effects on Real Estate at IVAR on Wednesday, February 6. Bruce Norris will be presenting 10 Decisions to Make Before The Next Downturn at CVREIA on Tuesday, February 12. Bruce Norris will be presenting 10 Decisions to Make Before The Next Downturn with IVAR on Wednesday, March 6.